Posted by Secrets of Grindea at 2012/06/22. Tags: live, Swedish Game Awards. Congratulations! I believed in you from the beginning! How’s it going to create the game? Everything as you want? The star has fallen on the land of mordor…… find it … you must.. RUN BOY! RUUUUUUN!!!! An award made by a racist swedish organisation. How quaint it was an easy win of course. 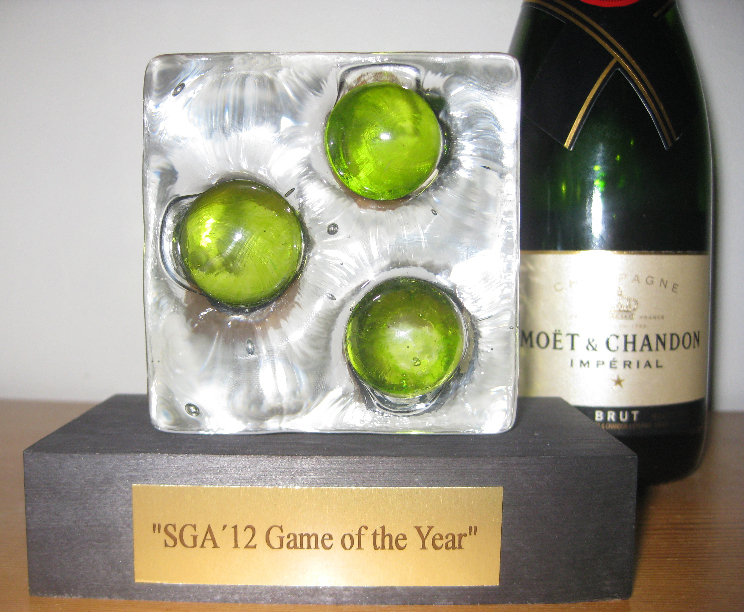 I quess SGA awarded you because they need some RPG credibility since FF Fortress completely failed. From what I saw I was almost sure that A Story About My Uncle was going to win. That’s not credibility enough to claim a racist organisation for a loss of something you supported, Serah. Honestly, who wins GOTY isn’t the only game that’ll get a ton of interest in it, but rather all of the nominees. Just to clarify: Swedish Game Awards is a student competition within Sweden. You may disagree with their choices (like in any competition involving judging) but I can assure you that racism couldn’t possibly have anything to do with it, since every competing team was from Sweden. I’ve played this game and I feel so cool saying it :D I’m so eager to play it in coop-mode though! Awesome of you to cover all the other great games in SGA, I really appreciate that. I didn’t play it a lot, but what I saw and heard was all well made and fun. I also love that you showed that 2D still is fun and beautiful. So, I normally don’t comment on your game blog just because I forget I can but damn. I’ve been following this game for what feels like an eternity, and am watching it grow more and more, and it’s fantastic! It’s one of the few indie games I’m actually planning on purchasing, without a doubt in my mind. So congratulations on your SGA win, well deserved! The effort you put in officially paid off! That’d undoubtedly be a good, if not required idea, considering bug reports and et cetera would be easiest handled with a forum, as well as showboasting your grindtacular stack of loot in the future. We’ll definitely open a forum at some point. When the next beta build is rolled out and people we don’t personally know start playing it, we’ll create a (super secret) beta testing forum for players to have discussions with both us and each other.